This article covers the SAML 2.0 authentication requests and responses that Azure Active Directory (Azure AD) supports for Single Sign-On. The protocol diagram below describes the single sign-on sequence. The cloud service (the service provider) uses an HTTP Redirect binding to pass an AuthnRequest (authentication request) element to Azure AD (the identity provider). Azure AD then uses an HTTP post binding to post a Response element to the cloud service. ID Required Azure AD uses this attribute to populate the InResponseTo attribute of the returned response. ID must not begin with a number, so a common strategy is to prepend a string like "id" to the string representation of a GUID. For example, id6c1c178c166d486687be4aaf5e482730 is a valid ID. Version Required This parameter should be set to 2.0. IssueInstant Required This is a DateTime string with a UTC value and round-trip format ("o"). Azure AD expects a DateTime value of this type, but doesn't evaluate or use the value. AssertionConsumerServiceUrl Optional If provided, this parameter must match the RedirectUri of the cloud service in Azure AD. ForceAuthn Optional This is a boolean value. If true, it means that the user will be forced to re-authenticate, even if they have a valid session with Azure AD. IsPassive Optional This is a boolean value that specifies whether Azure AD should authenticate the user silently, without user interaction, using the session cookie if one exists. If this is true, Azure AD will attempt to authenticate the user using the session cookie. All other AuthnRequest attributes, such as Consent, Destination, AssertionConsumerServiceIndex, AttributeConsumerServiceIndex, and ProviderName are ignored. Azure AD also ignores the Conditions element in AuthnRequest. The Issuer element in an AuthnRequest must exactly match one of the ServicePrincipalNames in the cloud service in Azure AD. Typically, this is set to the App ID URI that is specified during application registration. This element requests a particular name ID format in the response and is optional in AuthnRequest elements sent to Azure AD. If NameIDPolicy is provided, you can include its optional Format attribute. The Format attribute can have only one of the following values; any other value results in an error. urn:oasis:names:tc:SAML:2.0:nameid-format:persistent: Azure Active Directory issues the NameID claim as a pairwise identifier. urn:oasis:names:tc:SAML:1.1:nameid-format:emailAddress: Azure Active Directory issues the NameID claim in e-mail address format. urn:oasis:names:tc:SAML:1.1:nameid-format:unspecified: This value permits Azure Active Directory to select the claim format. Azure Active Directory issues the NameID as a pairwise identifier. urn:oasis:names:tc:SAML:2.0:nameid-format:transient: Azure Active Directory issues the NameID claim as a randomly generated value that is unique to the current SSO operation. This means that the value is temporary and cannot be used to identify the authenticating user. Azure AD ignores the AllowCreate attribute. The RequestedAuthnContext element specifies the desired authentication methods. It is optional in AuthnRequest elements sent to Azure AD. Azure AD supports only one AuthnContextClassRef value: urn:oasis:names:tc:SAML:2.0:ac:classes:Password. The Scoping element, which includes a list of identity providers, is optional in AuthnRequest elements sent to Azure AD. If provided, don't include the ProxyCount attribute, IDPListOption or RequesterID element, as they aren't supported. Don't include a Signature element in AuthnRequest elements, as Azure AD does not support signed authentication requests. Azure AD ignores the Subject element of AuthnRequest elements. Destination: When sign-on completes successfully, this is set to the RedirectUri of the service provider (cloud service). InResponseTo: This is set to the ID attribute of the AuthnRequest element that initiated the response. Azure AD sets the Issuer element to https://login.microsoftonline.com/<TenantIDGUID>/ where <TenantIDGUID> is the tenant ID of the Azure AD tenant. The Status element conveys the success or failure of sign-on. It includes the StatusCode element, which contains a code or a set of nested codes that represents the status of the request. It also includes the StatusMessage element, which contains custom error messages that are generated during the sign-on process. The following sample is a SAML response to an unsuccessful sign-on attempt. <samlp:StatusMessage>AADSTS75006: An error occurred while processing a SAML2 Authentication request. AADSTS90011: The SAML authentication request property 'NameIdentifierPolicy/SPNameQualifier' is not supported. In addition to the ID, IssueInstant and Version, Azure AD sets the following elements in the Assertion element of the response. This is set to https://sts.windows.net/<TenantIDGUID>/where <TenantIDGUID> is the Tenant ID of the Azure AD tenant. Azure AD signs the assertion in response to a successful sign-on. The Signature element contains a digital signature that the cloud service can use to authenticate the source to verify the integrity of the assertion. To generate this digital signature, Azure AD uses the signing key in the IDPSSODescriptor element of its metadata document. This specifies the principal that is the subject of the statements in the assertion. It contains a NameID element, which represents the authenticated user. The NameID value is a targeted identifier that is directed only to the service provider that is the audience for the token. It is persistent - it can be revoked, but is never reassigned. It is also opaque, in that it does not reveal anything about the user and cannot be used as an identifier for attribute queries. The Method attribute of the SubjectConfirmation element is always set to urn:oasis:names:tc:SAML:2.0:cm:bearer. This element specifies conditions that define the acceptable use of SAML assertions. The NotBefore and NotOnOrAfter attributes specify the interval during which the assertion is valid. The value of the NotBefore attribute is equal to or slightly (less than a second) later than the value of IssueInstant attribute of the Assertion element. Azure AD does not account for any time difference between itself and the cloud service (service provider), and does not add any buffer to this time. The value of the NotOnOrAfter attribute is 70 minutes later than the value of the NotBefore attribute. This contains a URI that identifies an intended audience. Azure AD sets the value of this element to the value of Issuer element of the AuthnRequest that initiated the sign-on. To evaluate the Audience value, use the value of the App ID URI that was specified during application registration. Like the Issuer value, the Audience value must exactly match one of the service principal names that represents the cloud service in Azure AD. However, if the value of the Issuer element is not a URI value, the Audience value in the response is the Issuer value prefixed with spn:. This contains claims about the subject or user. The following excerpt contains a sample AttributeStatement element. The ellipsis indicates that the element can include multiple attributes and attribute values. Name Claim - The value of the Name attribute (http://schemas.xmlsoap.org/ws/2005/05/identity/claims/name) is the user principal name of the authenticated user, such as testuser@managedtenant.com. 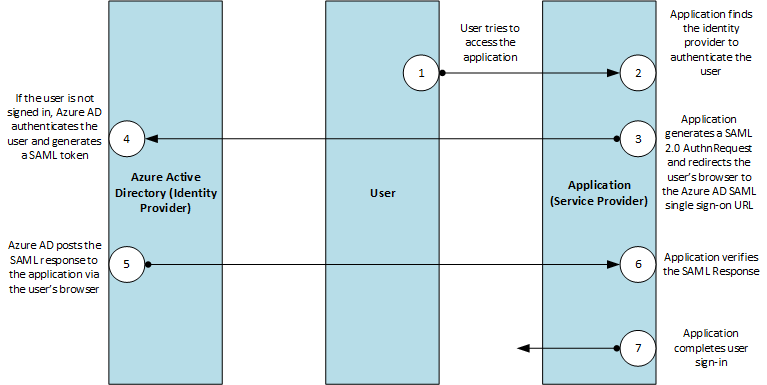 ObjectIdentifier Claim - The value of the ObjectIdentifier attribute (http://schemas.microsoft.com/identity/claims/objectidentifier) is the ObjectId of the directory object that represents the authenticated user in Azure AD. ObjectId is an immutable, globally unique, and reuse safe identifier of the authenticated user. This element asserts that the assertion subject was authenticated by a particular means at a particular time. The AuthnInstant attribute specifies the time at which the user authenticated with Azure AD. The AuthnContext element specifies the authentication context used to authenticate the user.